The first in the new Sherlock Holmes Bookshop series. Elementary, She Read is published by Crooked Lane Books.It’s now available in ebook and hardcover formats. Paperback coming in August. 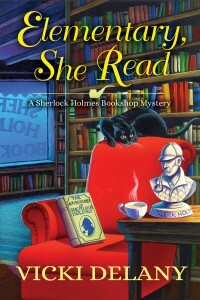 The discovery of a rare and valuable magazine in the Sherlock Holmes Bookshop and Emporium takes the highly perceptive Gemma Doyle and her ever-confused friend Jayne Wilson deep into the world of Sherlockania. What do cozy authors have to say about Elementary She Read? Vicki Delany is one of my favorite mystery authors and with ELEMETARY, SHE READ, she has outdone herself. This first book in her intriguing new series features Gemma Doyle, a wonderfully appealing protagonist who runs the Sherlock Holmes Bookshop and Emporium, where delightfully quirky characters and fascinating old books flourish. I loved everything about this story! The Cape Cod setting was enchanting and the intricate mystery kept me turning pages late into the night. Easily one of the best new mystery series on the market. Read the first chapter of Elementary, She Read here!